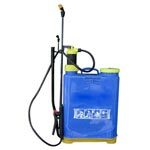 We offer you an excellent quality Knapsack Sprayer which offers unsurpassed performance. Durability and compact body structure are some of the features that make it best suited as per the specifications of the customer. Cost effectiveness is the prominent feature which makes Agricultural Knapsack Sprayer highly demanded. We are reckoned as one of the most dependable Manufacturers Suppliers of Hand Knacksack Sprayer in the world market. 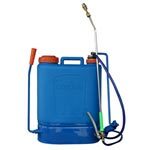 Compact knapsack sprayer with tank moulded from H.D. polyethylene. Suitable for all crops, develops sufficient and continuos pressure, tank very comfortable both sides back rest. Lifting handle at top.